"In 1958, Scotch-Brite introduced the first scouring hand pad to the food service industry. For 2017, we’ve reinvented the hand pad to continue the evolution of one of our most successful cleaning products, the Scotch-Brite™ General Purpose 96"
ST. PAUL, Minn.--(BUSINESS WIRE)--Scrubbing pots and pans has always been a grueling task. Kitchen aids can now cut back on the elbow grease with the new Scotch-Brite™ Dual Purpose Scour Pad 96Hex from 3M. Introducing a new shape that is both longer lasting and user friendly, the hexagonal hand pad features a yellow side with the latest in scouring technology, and a gray side that polishes away fine particles and grease. The Scotch-Brite™ Dual Purpose Scour Pad 96Hex is designed for medium duty general purpose cleaning including: aluminum pots and pans, cooking appliances and utensils, and kitchen and maintenance equipment. Its greatest innovation is in the raised power dots on the yellow side. 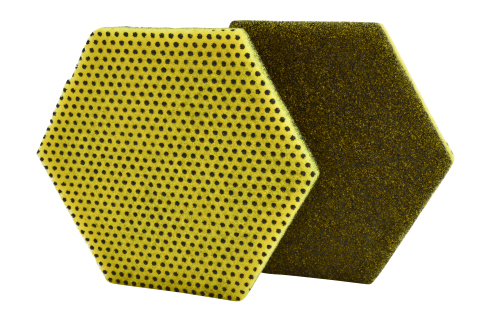 The surface pattern of the power dots was engineered to quickly and effectively cut through stubborn, baked- or burnt-on food five times faster than non-3M competitive medium duty scouring pads. It’s also designed to be more durable and retain its full scouring power through repeated uses. The yellow side has a special treatment that prevents particles of food from getting trapped on the web, allowing them to be rinsed away easily. The smooth gray side scours away fine food particles and leaves a shiny surface. The hexagon design of the pad is more ergonomic and functional. The hexagon shape features two additional edges than the traditional rectangle shape, offering up more corners to get in and clean the hard-to-reach areas of pots and pans. Additionally, the ergonomic hexagon shape fits comfortably in the hand, maximizing productivity and minimizing user fatigue. 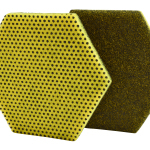 The Scotch-Brite™ Dual Purpose Scour Pad 96Hex is the latest innovation from 3M Commercial Solutions Division. Recognized and respected as a leading food service solutions provider for more than 50 years, 3M continues to be a trusted brand in food service cleaning tools, utilizing technology to help improve the operational efficiency and performance of quick-service restaurants. To learn more about the product, or to request a free sample, please visit: www.3M.com/96Hex.